There are a few scenarios in your business where you may need to rethink your brand or logo. Maybe you're opening your practice from scratch. 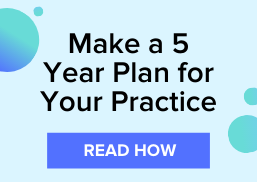 Maybe you recently purchased a practice. Or, maybe you've been in practice for 20 years and need a brand refresh. In any case, it's important to think through the reasons why you need a new logo, and what you're hoping to accomplish. What is your brand identity? After you've taken the time to ask yourself these questions, you'll be ready to start the design process. We've listed 5 traits that we think successful brands portray within their logo. One thing that might not come to mind when initially brainstorming and designing a new logo for your practice is scalability. Your logo needs to look great at 1 inch on a computer screen, and at 5 feet printed on an outdoor sign or banner. You never know the context of when you'll need to quickly slap your logo on a new sponsorship sign, print material, or online ad. A lot of times when it comes to design, less is more. In most cases a simpler logo will be easier to scale as discussed above. A simple logo should also be able to clearly portray your message. While your logo still needs to be visually appealing, you don't want people to have to think hard when they look at it to understand what you and your business represent. Many small businesses don't have the budget to have an on-hand graphic designer who can consistently make brand updates on a frequent basis. If you decide to pay the bill and get your brand designed by a professional, the end result should be able to stand the test of time so that in 5, 10, or even 20 years the design of your logo is still relevant. Good logos are built around elements that have been or will be around for a very long time. For example, a car dealership that created their logo around a car key now has a logo with an element that has already become irrelevant over time. Aside from just the elements in your logo, try to stay away hot design trends. Artistic trends change from year to year, so what's popular in design right now, most likely won't be within just a couple of years. Having a brand that is recognizable solely from a logo is a challenging task, and finding that balance of simple yet memorable is a hard balance to achieve. A few simple suggestions when starting to design a memorable logo are to skip your first idea, and if you're looking to stand out from your competitors skip the use of traditional eyecare symbols like eyes and frames. You may have a great idea for your eyecare practice brand, but without a design professional to help you, you could risk it being poorly executed. Having a design professional fine-tune your vision and design, and someone who can give you everything you need to apply your logo in any scenario will help you rest-assured that your practice is being professionally represented at all times. You're going to need various file types, sizes, and versions of your logo that you can use at a moment's notice. Having your logo on hand with a transparent background, white background, a grayscale version, an all white version, small size version for promo items like pens, and a vector format version that can use scaled for large prints are just a few of the different files you should have on hand for your logo.